We’ll get your gutters clear and flowing again! Overflowing gutters aren’t just unsightly, they can be the cause of serious property damage if they allow water to get into your home. Mold, mildew and even wet rot can result! Gutter cleaning is part of the regular maintenance of today’s modern homes. 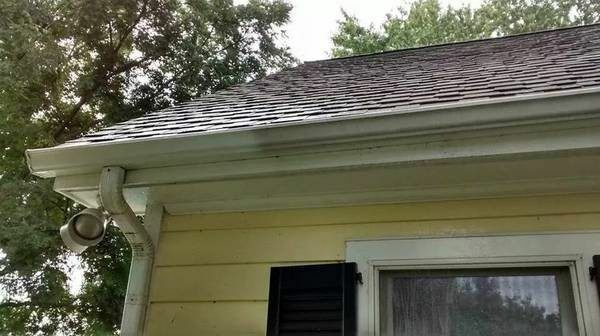 Gutters are purposed to stop the roof’s runoff water from puddling near the structures foundation, which if left inchecked, can cause erosion, a loss of structural integrity, and mold. When leaves block up the guttering, water flows over, down, and around the gutters, sometimes puddling up on the roof and causing rot and mold to the roof and trim. 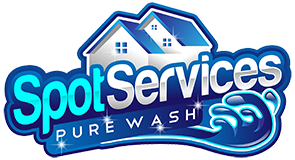 Regular mantenance is a necessity,and thats why Spot Services is here to the rescue! Whats included with our gutter cleaning services? Basic- The Removal of all organic material from the gutters and entrance of the downspouts. Deluxe- Includes Basic Service, plus the clearing of downspouts and a water flow check to make sure everything flows smoothly. Premium- Includes Deluxe Service, but features a high pressure flush to ensure the removal of all shingle grit, ensuring complete, like new performance. If you’d like to schedule your next gutter cleaning, don’t hesitate to call us at 410-822-4144 , or get an instant quote by clicking the blue “Give Me A Bid” button at the top of the page. We also offer a gutter whitening service using a unique cleaner just for gutters. Say goodbye to green algae, lichen, moss and traffic film as we restore the sparkling white you remember! We can wash all your plastic or aluminium gutters, fascia boards and soffit- and help your house feel like a home again! Gutter Whitening Makes a HUGE Difference!!! SERVICES AREAS INCLUDE; MARYLAND & DELAWARE, CAMBRIDGE, EASTON, ST. MICHAELS, OXFORD, BOZMAN, TILGHMAN ISLAND, PRESTON, DENTON, CORDOVA, QUEENSTOWN, CHESTER, KENT ISLAND, ANNAPOLIS, CHESTERTOWN, STEVENSVILLE, CENTERVILLE, SEAFORD, GEORGETOWN, DELMAR, SALISBURY, FRUITLAND, OCEAN PINES, OCEAN CITY, BERLIN, OCEAN VIEW, REHOBOTH, BETHANY BEACH, FENWICK ISLAND, GLEN BURNIE.